What if you didn’t grow up with a chainsaw, or don’t have a friend to teach you, what do you do then? No problem, we’re here to help and this is what this guide is all about. 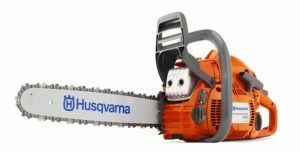 The interactive chart of chainsaws below and the analysis that follows will help you choose the best chainsaw for the money for you. 3 How to Find the Right Chainsaw? 7 How to Find a Chainsaw That Meets Your Needs? The chainsaws included on this chart actually only begin to scratch the surface. So many models and manufacturers are there that it is nearly impossible to list them all. However, many exceptional chainsaw reviews are included from various viewpoints and manufacturers. Most of the chainsaws included above have a power output greater than 1.5 KW, which is an essential criterion for choosing a proper chainsaw. However, you will indeed notice that many of them are electric chainsaws that also make good options. Honestly, all the chainsaw models listed above are excellent options, but there are a few that we just need to point out as our favorites. Below you will find out our top 5 picks for an overall best chainsaws for themoneyy along with a more detailed review of each. Husqvarna chainsaws have been there for pretty long. 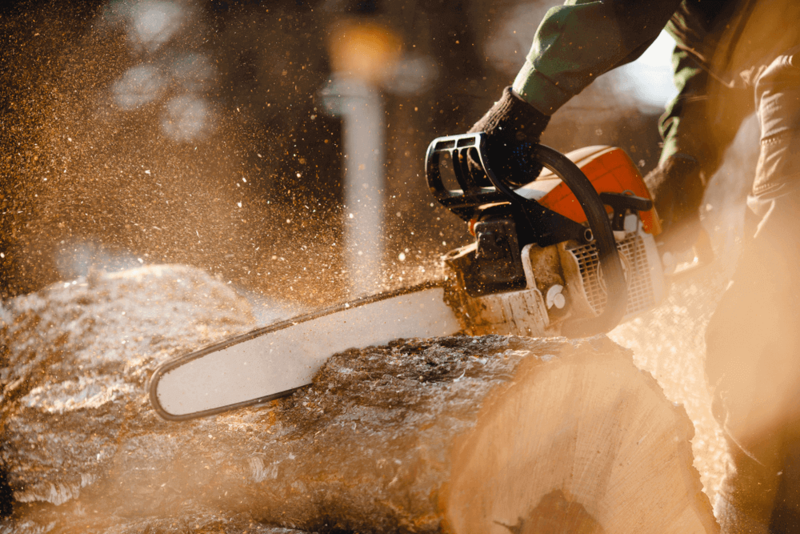 With many years of making, designing and selling chainsaws, it should come as no surprise that one of their creations topped our list of best chainsaws. With a 60.3 CC motor and power output of 2.7 KW, the Husqvarna 460 Rancher is a perfect tool to be included in the arsenal. The power is great and the 18” bar is more than awesome. It cuts everything like a hot knife through butter. More than 50 reviews on Amazon have confirmed that all the parts supplied are of really good quality. Changing the guide bar and other parts is easy, but make sure to keep the chain brakes off while messing up with this tool. We had no problem in replacing the chain and adjusting the tension in the chain was also convenient. The decompression valve in the engine works great in smoothing the pulling of starter cord and provides a soft start. The instructions manual is clear and based on that the saw can be configured in minutes. Although this version is the little bit heavy, this makes difficult to operate it for longer intervals. it is not the cheapest option but it is worth spending your money on such a powerful machine. 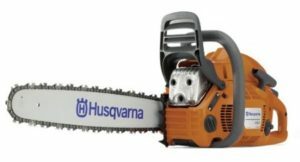 You will get a good chainsaw at this price which is reliable in most situations and is also viewed positively by most other users. The Makita UC3530A is one of the most powerful chainsaws on the market today. With nearly 80 reviews on Amazon, this product is not only well-tried but also well-reviewed by people. 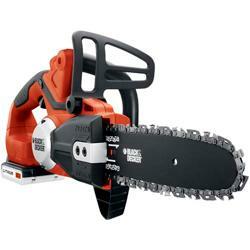 It is the only gas chainsaw that we have included in our list of best chainsaw models. The design is a clear reason why people like this chainsaw. Not only does it have a nicer design that makes it easy to operate but it’s also built to last. 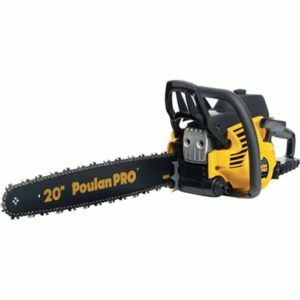 With 15 Amps motor and a 14” bar, you get a good quality saw that is well balanced to easily cut trees of large diameter. Although it is a gas saw, it has an easy to start system. The machine is not harsh to ears and cuts silently even after continuous use for many hours together. It also has auto braking, kickback bar and automatic oiling system that make using this tool very productive and safe. But one of the reason, it’s so popular is the price. With a quality brand, an engine that has a ridiculous amount of power, and durable material, you would expect something on the higher end. But you can pick up this great chainsaw for just 200 Bucks. Based on the ratings, design, engine power and reputation of the maker, Oregon CS-250E is the best electric chainsaw anybody could own. With a 14” guide bar and just 5.4 lbs. weight, it is one of the lightest saw that we reviewed. It is very light and portable, provides quick and clean trimming. Although battery power saws are excellent for occasional cutting they are not good for slicing larger trunks. But it is an ideal tool for cutting hardwood trees and smaller limbs with nearly 10 inch diameter. The saw is very well balanced and comfortable to handle. It sets in operation only when you press the trigger so it is pretty safe to work with. This also saves a lot of battery for long and continuous use. While using the 40 V battery lasted longer than expected. The noise level is minimum; you will get no complaints when operated in public. No need for any hearing equipment and therefore the mental fatigue is also less. The automatic sharpening system provides an easy way to sharpen the chain by just pulling the lever for a few seconds. it’s on the higher end, but you get a quality chainsaw with a design that serves no problems during regular maintenance. Oregon is a well-known brand for its quality equipment. Many other chainsaw brands use Oregon parts in their machines and they have been there since 1947. The chainsaw currently has received only 4.6 rating from those that reviewed it on Amazon. So if you want a durable, powerful and smooth machine, don’t just take our word for it, take note of other people also who have publicly rated it as well. Remington has been in business since 1900. So with more than 100 years, they are an experienced player in the chainsaw market. The Remington RM1015P is an electric chainsaw with an attractive price tag. This model has scored 4.3 rating in nearly 200 reviews on Amazon, so reliability cannot be a problem in any case. Although with a less powerful engine it is not ideal for tougher jobs it does provide you a low entry point with a reasonable price. The RM1015P weighs 12.4 lbs. overall and has a bar length of 12 inches. The 8 Amp motor drives the anti-kickback bar and chain with 1.5 HP energy. 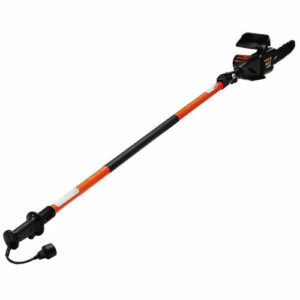 It is an ideal pole saw that extends your capacity to reach overhead branches up to 15 feet high. 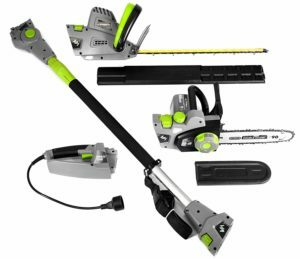 Not only do those who have reviewed this electric pole saw like it, they RAVE about it. 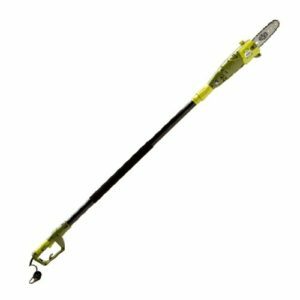 The attached pole is made from high-quality material that is strong enough to tolerate high pressure applied to cut hard limbs. 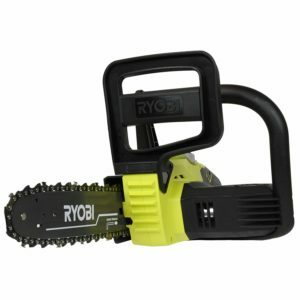 This saw will easily let you fell 10” trees without any problem and clear limbs around the rooftop. Perhaps an ultimate electric model built specifically for sawing limbs is the B&D LCS120 chainsaw. Make no mistake, this is not a gas powered saw, it’s only intended for lighter work. You can cut, slice and saw down 8”-9” diameter wood in just matter of minutes, there are clear and good operating instructions included in the manual. This lightweight 5.1 lbs. a machine has 8” bar installed on it with a 20 V battery which lasts easily for half an hour and lets you cut around 10 pieces of logs in a single round. You need a second battery for continuous use. One of the biggest advantages is that you are not tied to the cord with this battery operated product. But it is a plastic made model which does not have a strong outside body and this is the reason behind its light weight. Black and Decker is an American manufacturer famous for outdoor electronic products. For its size, engineering and quality of construction this chainsaw would be an excellent choice for sewing needs. Stihl: It is not only manufactured chainsaw but also other outdoor tools like mist blowers. Husqvarna: It is a most professional brand Headquartered in Sweden. BLACK + DECKER: They are market leaders of the chainsaw for homeowners. ECHO: They are manufacturing powerful chainsaw and reliable chainsaws. 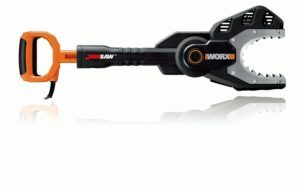 WORX: It is a Chinese brand and their products are very reliable and sturdy. Makita: Its chainsaws are more expensive and other competitors. How to Find the Right Chainsaw? Buying a chainsaw cannot be taken lightly. Relatively expensive, it is a highly technical and powerful tool but it can quickly become ineffective and dangerous when the model is not suitable or appropriate for the user and the type of work to be done ( pruning, felling, sawing …). Follow the guide given below to better define your needs and then choose accordingly! The choice between all types of saws depends on the type of work to be done, diameter and nature of wood, frequency of use, desired ease of use and the budget of course. For felling a tree, always opt for a powerful model, preferably a gas chainsaw with a guide bar at least as long as the diameter of the trunk (if the trunk section is too large, however, you can cut several times). If there are young trees with thin and tender stems, an electric saw, however, may be sufficient. In this case, check if you have a nearby electrical outlet or extension cord long enough. Once the tree is on the ground, all the branches need to be removed. The operation is delicate. You can of course use the same saw that was used for felling the tree. However, it is preferable to use a small compact model (electric or gas) that will be easier to handle and you can easily switch between the branches. After limbing the tree, we must charge the trunk into pieces. The same saw which was used for slaughter can be used to perform this task. Choose a model with a power range from 1500 W to 2500 W (depending on the timber- density) with 30 to 40 cm long guide bar (depending on the diameter of the logs). Normally, an electric model should be sufficient to slice firewood provided, again, that you have an electrical outlet nearby. Pruning is done to remove dead or overgrown branches or stems, especially to increase fruitfulness and growth. For small branches, use a small cutter or pruner kind of trimming machine. But it is strongly recommended to use a special saw for safety reasons, especially if the tree is top work. If pruning is to be done from the ground, use a pole saw (called pole-pruner whose engine is at the bottom) which, depending on the model is long enough to reach branches up to 4 m high. If you have to climb the tree, use a chainsaw pruner which is specially designed to be used with one hand leaving the free second to hold on to branches. If you have to cut according to scale, use a chainsaw pruner or a small saw (gas or electric). The diameter and the nature of wood (its hardness) must also be taken into account when buying a chainsaw. It determines the length of the guide bar be used on the saw, and therefore its power. For effective operation, the length of the guide bar should be equal to or greater than the diameter of the trunk. Less powerful, battery operated chainsaws have a cutting capacity of up to 25 cm. 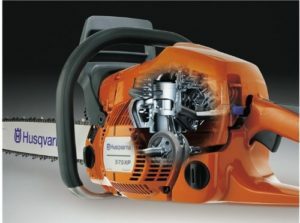 Electric chainsaws (mains) or gas models can cut wood with a diameter of 45 cm maximum. Learn about the hardness of the wood to cut it easily, cleanly and safely. The trees of medium density hardwood (like chestnut, cherry, fruit) or low-density hardwood (like birch, alder) are very easy to cut. The trees of high-density hardwood (like the charm, beech, oak, ash) or softwood (like pine, maritime pine) provide a strong resistance against the chain, which can slow it down – or sometimes even stop it – if a machine is not powerful enough. The ergonomics of a chainsaw is crucial in the act of purchasing. The body of the machine must be thin and well-balanced, even for occasional use. When you hold it with both hands, it should not have a tendency to tilt forward or backward. Also, check that it is not too heavy because this directly affects its handling and may cause fatigue. Be careful with the layout of controls and handles, ease of adjustment (tool-less chain tensioner, air purge). And check if it has anti-vibration handles, especially if it is a gas model. Finally, ask about the sound power (it is usually around 100 dB), especially if you use it in town. Note that gas chainsaws (with internal combustion engines) are much noisier than electric models. Note: Every increase of 10 DB is roughly translated a volume felt twice as large. After defining your needs, you should compare the specifications of each model before making the final decision. Type of engine, engine power, length of the guide bar, after sales services is many points to be considered while purchasing. Once you have identified the needs, you will have to choose between a gas or electric model (mains or battery), keeping in mind that the higher the power, the higher is the weight, noise and vibration levels. Used by professionals as well as individuals for heavy duty cutting, the gas saws are very powerful, which gives a very good performance. They are relatively noisy, polluting and produce strong vibrations. 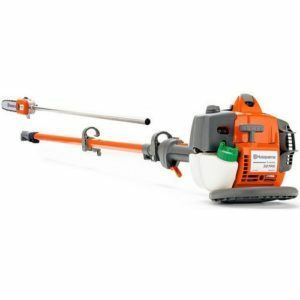 Recommended for casual use and for wood of medium diameter, the electric saws are easier to use, quieter, lighter but with less interesting power / weight ratio as compared to gas chainsaws. Their use requires having to close an extension cord or outlet. 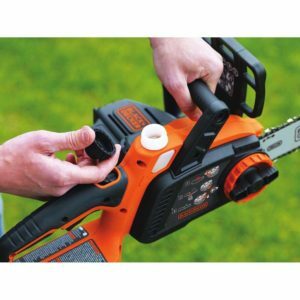 Particularly handy, light and quiet, the wireless chainsaws have a rechargeable lithium battery (18 V) which allows freedom of movement. 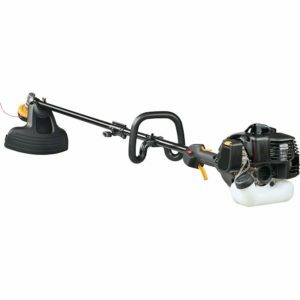 Cons: they have moderate engine power (between 600 and 1000 W), can be operated for short sessions (15 to 25 minutes on average) and their use is limited to small pruning or cutting off branches of small diameter. The charging time of the battery is an average of 6 to 8 hours. It depends on the type of work to be done, the diameter, the nature and density of the wood. For electric chainsaws, take into account the power, expressed in watts (W or kW). Also, check the engine capacity (cm3 or cc): the higher it is, the more it reduces the ability of wood to stop the chain. So if you need to cut a leafy tree with an average density, first pay attention to the power (W) of the engine while if you need to cut a small but very hard (or softwood) tree, you must also ensure that the displacement (cc or cm3) is relatively high (see the nature of the wood). Small chainsaws are generally between 30 cc and 35 cc. The most powerful models are between 35 and 50 cc. The professional machines can also reach up-to 125 cc. Note, however, that the higher the capacity, the higher is the weight of the machine. 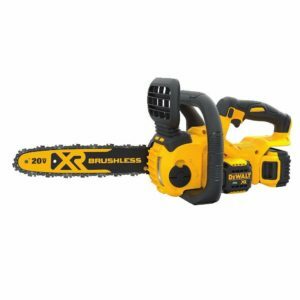 Gas chainsaws: 2 strokes or 4 strokes? For gas chainsaws, you can choose between 2-stroke or 4 stroke engines, each with its advantages and disadvantages. 2-stroke engines, the most popular, have lower weight, are easy to start and offer a very good return. By cons, they are very noisy. They use a mixture of oil and fuel. 4-stroke engines are heavier but they have cleaner and quieter parts. They did not need a mixture of oil and fuel and run on unleaded fuel. Note: To meet the new standards, manufacturers have developed new greener combustion engines that can significantly reduce fuel consumption and exhaust emissions. How to Find a Chainsaw That Meets Your Needs? 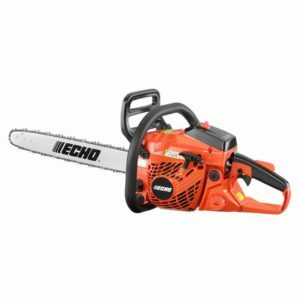 Above you will find an interactive comparison chart of many chainsaws on the market today. But before you start salivating over your next destruction companion; let’s take a look at what’s on this guide. Overall, rather than taking some guys advice on YouTube or Forums about what the best chainsaw is, look at the options and criteria to help you make the appropriate buying decision. So, above you will find the Ultimate Chainsaw Comparison Guide to help you find the perfect chainsaw for you. We also have some top chainsaw reviews listed below to jump start the selection process. Now that you have seen the options and reviewed our top picks for the best chainsaws for the money, it’s up to you to pick something that satisfies your needs is in your budget and overall help you gear up for your sewing adventures. As you know new chainsaw models are created daily by new and old manufacturers. For that reason, the comparison chart would be updated as new chainsaws are added to the list. Or if you feel a superior machine is missed that deserves an entry in the list, then let me know in the comments below!